FoodFutureCo - Can we have our [beef] and eat it too? Plant-based proteins have a new audience: meat eaters. Market data indicates that more and more people are seeking to reduce their meat intake. For the discerning consumer, there are any number of motivating factors: the health benefits of reduced meat consumption are increasingly recognized; animal rights activists are shedding light on the cruel realities of factory farming; and, as discussions of climate change reach new levels of urgency, animal agriculture is more frequently acknowledged as a major contributor. According to a World Resources Institute study, the average American diet causes nearly twice the greenhouse gas emissions as the average diet worldwide. The same study reports that the average American could cut the environmental impact of their diet in half just by scaling back on their animal product consumption. A slow but steady push for alternatives to meat is driving innovation and investment in future-friendly food by everyone from Google to Bill Gates to, yes, even Tyson Inc. — the U.S.’s biggest meat producer. The Better Buying Lab, a World Resource Institute initiative, has been partnering with influential companies like Google and Panera to nudge consumers to make more sustainable food choices. Panera, which has a history of promoting plant-based proteins and taking animal welfare into consideration, recently launched a plant-based menu on its digital platform to make identifying and ordering any of its 30 vegetarian and vegan options easier. Meanwhile, Google campus restaurants are adjusting menus to feature plant-based options more prominently, and Google’s chefs are busily developing dishes in line with the company’s sustainability goals, such as a vegan taco recipe designed to outshine its meaty counterparts and a burger patty that’s 50 percent mushroom. This is what Scott Giambastiani, Google’s global food program chef and operations manager, refers to as a “flipped product” — one that replaces a significant portion of meat with plants. Since this blended burger was introduced, Google chefs have slowly transitioned it from being 20 to now 50 percent mushroom-based. Throughout the month of August, Sonic Drive-In menus will also be sporting a blended patty: The Slinger. In fact, mushroom-beef burgers are appearing in restaurants across the country as part of the James Beard Foundation’s Blended Burger Project, which challenges chefs to create a burger that is at least 25 percent mushroom. However, it’s the full-on plant-based patties that are really making headlines, with the Beyond Burger and the Impossible Burger from startups Beyond Meat and Impossible Foods, respectively, leading the charge. As with the blended burgers, the target consumers are not vegans or vegetarians but rather the much larger meat-eating contingent of the population. The Beyond Burger is carefully formulated to look, taste, and “bleed” like beef. (The bleeding is courtesy of pulverized beets.) As Beyond Meat CEO Ethan Brown rightfully points out, beef ultimately comes from plants in the first place; Beyond Meat is simply relieving the cow of the task of turning plant proteins into meat proteins. Yet every aspect of their product from the amino acids, to the lipids, trace minerals, and carbohydrates has been meticulously prepared and combined to create a remarkable meat mimesis. And certainly there are promising market signals that the Beyond Burger could reach fast food echelons of ubiquitousness. Former McDonald’s CEO Don Thompson joined the board for Beyond Meat in 2015. This past May, Beyond Meat inked a deal with Safeway, securing distribution in 280 Safeway supermarkets, and over the summer the burger rolled out in 600 Kroger-brand stores across 13 states, effectively tripling its circulation in the space of eight weeks. While the beety burger has been available in Whole Foods — notably sold in the meat aisle — since 2016, this most recent expansion into America’s largest grocery chain is a significant step towards taking plant-based protein from health-food markets into the mainstream. Meanwhile, Silicon Valley startup Impossible Foods is making parallel moves to reach mainstream markets. Like the Beyond Burger, the Impossible Burger “bleeds,” but this time it’s not beets. Impossible Foods has engineered plant-based heme. Heme is the iron-containing component of hemoglobin, the protein that makes blood red and that carries oxygen. Impossible Foods uses soy leghemoglobin, manufactured en mass via yeast, which lends their product the metallic umami of meat. 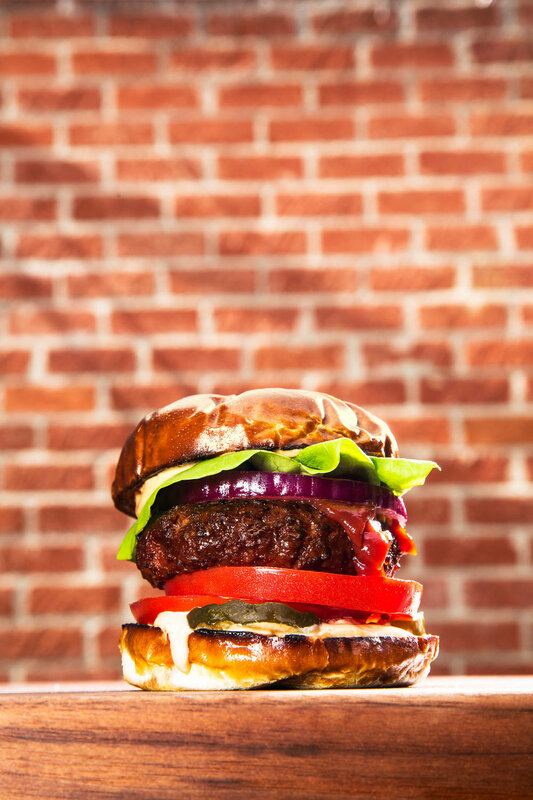 While the Impossible Burger has historically only been available at upscale eateries such as Momofuku Nishi in New York, Impossible Foods recently launched the patty at mid-priced burger chains including Umami Burger locations in California and Bareburger in New York. After unprecedented success as a top selling menu item during its initial month at Bareburger’s flagship location in lower Manhattan, the Impossible Burger is now a regular menu item at six Bareburgers around the city. This comes on the heels of Impossible Food’s expansion of their Oakland plant this past May, which increased their production capacity 250 times. At the end of July, Impossible Foods closed a successful fund-raising round of $75 million with Bill Gates (who has also invested in Beyond Meat) once again coming on board as well as the third richest man in Asia, Li Ka-shing. According to Impossible Foods, the Impossible Burger requires 75 percent less water, uses 95 percent less land, and emits 87 percent fewer greenhouse gases than conventional ground beef. It’s no wonder the plant-based meat market is projected to reach $5.96 billion by 2022. A report by Lux Research indicates that plant proteins could achieve a 33 percent market share by 2054. Add to that the groundbreaking work of companies like Memphis Meats, Hampton Creek, SuperMeat, and Mosa Meat to bring cultured meat (i.e. meat made from animal cells grown outside the animal) to market, and who knows? The dominance of the meat industry may be starting to wane. Perhaps we really can have our [beef] and eat it too.